My parents' last weekend in China, we traveled together to Yangshuo. Said to be a small town in southern China, the population is a mere 300,000 - practically a village, by Chinese standards. We stayed at the Yangshuo Mountain Retreat, billing itself as an escape into the incredible landscapes surrounding the Li River and its tributaries. The scenery was breathtaking and mysterious. Karst hills are a rare geologic phenomenon, and no doubt their rarity add to the mysterious appeal. The immediate rise and falls of these green hills amidst lush fields of rice, winding rivers and trees like bright green feather dusters made every step one of beauty. 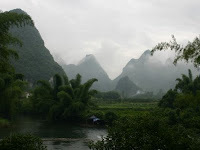 But Yangshuo is a tourist town. We rarely got a glimpse of the river without its being full of bamboo boats with 2 tourists in bright orange life vests upon each one. We saw nary a cormorant, and everyone spoke enough English to try to sell us a carved wooden duck or a water gun. We ate good food - some delicious, almost all Chinese. We took fun walks - most of the hikes were rather short and quite child-friendly. We explored the town - billed as a realistic Chinese city; we found it more of a market town where everything is for a negotiated price - including Columbia shorts and Coach bags. The town felt authentically Chinese more in the ram pant commercialism and the overcrowding than in the immersion of local culture. Certainly we enjoyed our time away. Just spending a weekend at a country resort as a family was wonderful time together. Getting out of Shanghai is always good, and the more greenery the better. But the next time we choose to escape the urbanity of Shanghai, we'll need to go a lot farther than Yangshuo.